Type 9821 Nitrile Rubber discharge Hose is made from a durable nitrile rubber blend that offers improved puncture resistance, a higher temperature range, and a higher working pressure rating than most PVC discharge hose styles. The nitrile through the weave construction means there is no separate tube and cover. 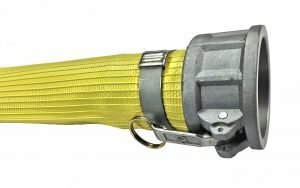 This hose offers the durability of a heavier hose construction with the benefits of a lay-flat hose. Nitrile rubber discharge hose is weather, oil, and abrasion resistant for demanding applications. 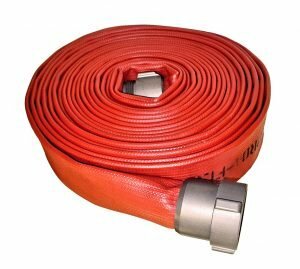 Nitrile fire supply hose is available with aluminum fire style internally expanded couplings installed, which are factory tested and NFPA approved (red hose photo). 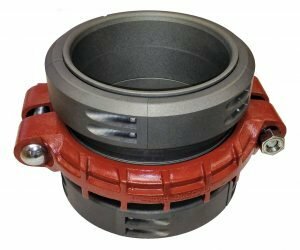 Also available with Storz style fire couplings in some sizes. Large bore long length assemblies are available with reusable bolted fittings (see below). Also known as flexible pipeline systems, these large bore lay-flat hoses are used for temporary water service in frac oil exploration. WARNING: This product contains DINP (Diisononyl phthalate), a chemical known to the State of California to cause cancer, birth defects or other reproductive harm. Do not use in connection with drinking water. Wash hands after handling. Visit www.P65warnings.ca.gov for additional information.